We are the longest standing floral design team for weddings and events in the Byron Bay area, established in 2001. We only take a limited number of bookings each season and should yours be one of them, we’ve developed a streamlined process to make it easy for you. Our bespoke event service provides you with an entirely beautiful high end event, where every little bit of attention to is detail taken care of. Your botanical styling is tailored specifically for you, with all our experience and professionalism making it an easy and inspiring journey along the way. 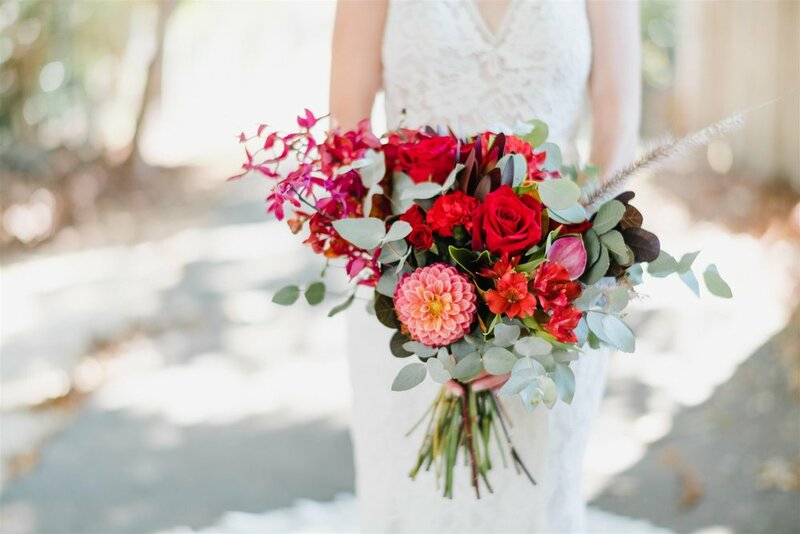 We’ve narrowed the process down to three appointments (phone, skype or in our Byron Bay or Newrybar florist) in which we will have your event flowers entirely organised. This gives you the time to relax more during your engagement, knowing that we’ve got your back! This one hour initial consultation will give us the opportunity to personally get to know you, whether on skype, over phone or in our Byron Bay (or Newrybar!) based florist. This is where we give you our undivided attention and when you can share with us in person all the essentials and your most desired floral dreams. We take this hour to look at inspo photos, take detailed notes, start attentioning logistics, and basically brainstorm all things botanical styling. For this appointment we ask that you come prepared with an idea of a budget, so that we know how we can service you best. This consultation can be booked over on our website and is $100 for the hour. After your first appointment, our team of Snr Floral Stylists will commence focused design work on your event specifically. We spend the time to sift through your ideas, photos, loves and all the botanical concepts you've shared with us to create one, cohesive design especially for you! To book in your first appointment, simply check our availability for your date and then click here to secure an appointment. We will then contact you to secure a time that suits you best. At your second meeting with us, we will present you with a design proposal that was inspired by you and put together by us. At this time we look at what works and what doesn't; what you simply can't live without and what may not be as important. We get the botanicals to a sweet spot, and we all can leave feeling inspired and in anticipation. This appointment is when we change your date on our calendar from pencil to ink, so a 50% deposit is required at the end of this second meeting. This deposit enables us to commit to your date completely as well as allows you to take ownership of all of the moodboards, quotes, and ideas we have prepared for you. If needed a deposit can be made at a later date, but until then we cannot ensure our availability, and we also have to keep your original designs with us. While most our clients don’t require more time, some do like to fine tune regularily with us and if you prefer to do that after the design proposal meeting, we can schedule monthly or quarterly planning appointments to assist you in the process of bringing the entire vision of the event together. Additional planning meetings are provided for $100 per hour. The final appointment is scheduled approxiamately six weeks prior to your event date. At this time we invite you to notify us of any last minute detail changes that might have occured (adding a buttonhole, table count change, hair & photography schedule adjustments etc). We also confirm all contacts and all logistics for the day, as well as answer any other questions you might have. We go over the remaining balance on your account and take the time to chat about any other details that need attention in order to make your dream a reality. We know that organising an event can be all consuming and we are right there by your side you to make it smooth sailing and easy for you! Our team would be delighted to meet you! To book in your first consultation, simply click here to secure an appointment with us! We will then contact you via email to make a time that suits you best. Booking your first appointment means we pencil your date in so you can then potentially secure a booking with us, before we get booked out. It is also an opportunity for you to ask any questions you may have and gain more knowledge about the ins and outs of wedding florals, with no obligation to lock anything in.